The RINO's and "Never-Trumpers" couldn't wait to join in with Democrats and pretend that somehow, as Trump was busy repudiating Neo-Nazi's and the KKK, that he somehow didn't repudiate Neo-Nazi's and the KKK. It is oh-so sickening and maddening and completely Orwellian. I mean, okay, in denouncing them he didn't call them out by name during his first comments....I get it. I don't agree with it, but okay, I get the argument. But maybe we should believe him when he said that he wanted to get all the facts before he further elaborated since the protest was not even fully dispersed when he offered those remarks. Sounds reasonable enough to me, although I confess we are talking about Democrats who have been acting as if their hair were on fire since they lost, hands down, the election. I suppose expecting Democrats to suddenly become the voice of reason is, well, unreasonable. But the Republicans have no such excuse. Their side won. Unless they really aren't on the side of conservatism as they claim and a conservative agenda. Oh wait. I guess they pretty much just proved that by not passing healthcare legislation after promising us for 7 years they would we can infer that they are not on board with a conservative agenda. At least several of them are not. And I stress, "at least". So now we are being told Trump should have known better. He should have called them by name, and not just denounce bigotry on both sides from the get-go. But he also didn't by the way, jump out and denounce Antifa or Black Lives Matter by name for their violence. He waited 24 hours for more information. That is being Presidential if you ask me. We expect reaction like Senator Graham's from Democrats. We expect this from the MSM (who not so coincidentally are mostly all Democrats). But we shouldn't have to (but I guess we kinda do) expect this from people in the President's own party. In this case, Senator Graham jumped on the fake news/destroy Trump merry-go-round where facts never matter. Professionalism and integrity go out the window. Receiving approval from the media when you try and take a bite out of Trump is your reward. Nothing matters except to tear down Trump at any cost for those like Graham infected with Trump Derangement Syndrome. President Donald Trump responded angrily to Sen. Lindsey Graham after the South Carolina Senator criticized his response to the violent protests in Charlottesville, Virginia. Since Trump’s press conference at Trump Tower, establishment media and Republicans accused him of creating “false equivalency” between two groups of protesters. 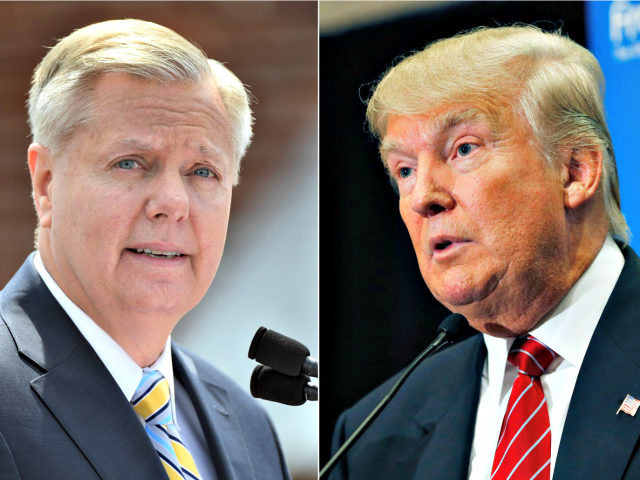 “I do not endorse this moral equivalency,” Graham said. During his press conference, Trump specifically denounced the hate groups at the rally in Charlottesville, denying that he was suggesting moral equivalency. The president reminded his followers that he beat Graham easily in the primaries, suggesting that he would lose his Senate seat in South Carolina.